This recipe was submitted by Arly Littleone, who swears by this dish to impress last-minute company. It’s not superhero, but looks like a pretty dish to serve guests. Boil large pot of water for pasta and cook pasta to desired tenderness. While water boils and pasta cooks, roast the capsicum, artichoke, garlic and onion with olive oil at 350 degrees until corners are just browned. In a medium bowl combine the roasted capsicum, garlic, onion and sun-dried tomatoes. Blend the mixture to taste and add in the passata, the vegan brown sugar and the leftover oil from the baking tray, stirring and seasoning to taste. Once you are happy with the flavors set the mixture aside. Heat one teaspoon of butter and some olive oil over high heat in a frying pan. Fry the mushrooms until they start to become crispy. Once the mushrooms are crispy, add in the capsicum mixture to the pan with a dash or two of wine and let simmer long enough for the wine to cook off. 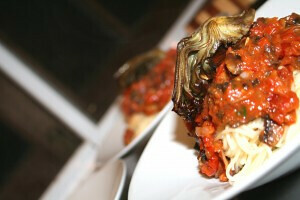 Serve the pasta topped with the sauce and a slice of the artichoke. What’s your favorite recipe to serve guests in a pinch? And what the heck is capsicum? Tell me in the comments below! I’ve never heard of it before. Next Postkind classics: easy ways to conserve water!